Cape Town - Aimee Barrett-Theron will become the first female referee in history to take charge of a Varsity Shield final. She will do so on Thursday, April 11 when NMU Madibaz host CPUT at the Madibaz Rugby Stadium in Port Elizabeth. 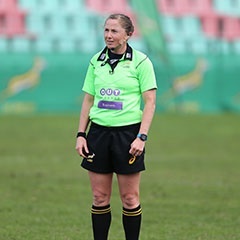 Barrett-Theron has refereed a number of high-profile matches in her career, including the 2016 Rio Olympics, Cup quarter-final of the Women’s 7s World Series in France in 2016, Varsity Cup, Craven Week, Currie Cup as well as an international under-18 match between England and France. "We have worked tirelessly behind the scenes to ensure equal opportunities for all, and we are very happy that Aimee has been chosen as the referee in the Varsity Shield final," said Varsity Cup manager Xhanti-Lomzi Nesi. Barret-Theron took up refereeing in 2014, beginning with the World Rugby Women’s Sevens Series. In a previous interview she commented on how great it was to be noticed as a referee rather than specifically a female referee. And while her gender didn’t matter as much as her judgement, it did influence how much effort she put in. “I had to work incredibly hard to get to where I am today. Coming into a male-dominated sport, I knew it was going to be tough,” she said. The Varsity Shield final will kick-off at 18:15 and will be broadcast live on SuperSport 1.